Today’s Object of the Day celebrates the winners of Cooper Hewitt’s National Design Awards. Honoring lasting achievement in American design, the Awards take place annually during National Design Week, with festivities for all ages celebrating design creativity and innovation. This inventive prototype for a storage system is at once playful, inventive and multifunctional. Blu Dot, the company that designed it, specializes in furniture that is elegantly designed as well as easy-to-assemble. 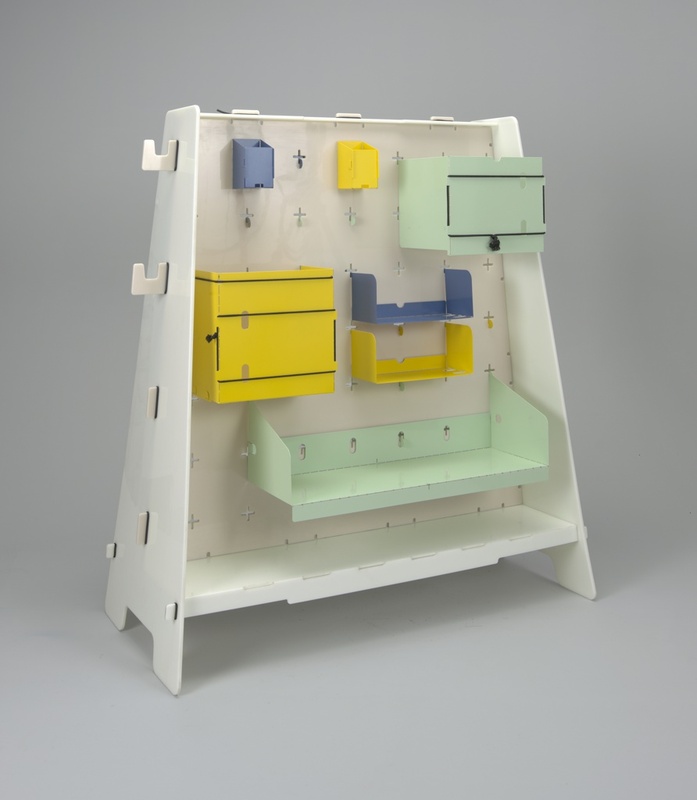 The storage unit, entitled Plug and Play is an erector set of filing units, shelves and other components which are plugged into a freestanding pegboard spine and held in position with elastic bands. Although this design did not reach the production stage, it demonstrates Blu Dot’s “good design” ethos which strives for usefulness and happiness available to ordinary people, every day. This one-of-a-kind storage unit reflects elements derived from popular culture in much the same way as furnishings created by American design icons Ray and Charles Eames. Ray and Charles Eames team built a reputation for their innovative designs for architecture, furniture, and textiles. During the second half of the twentieth century, they began experimenting with new materials and technology, and opened the door to the use of molded plywood and plastics, introducing functional, colorful, and affordable furnishings to the middle class. Blu Dot’s Plug and Play has a resonance with the ESU 400 Storage Unit, a well-known Eames design, also in Cooper Hewitt’s collection. Made from laminated wood with a metal rod frame, the ESU allowed for flexibility in the placement of components making the storage unit easily customizable. The Plug and Play storage system from Blu Dot, designed a good half century later than the ESU, further develops the ideas of flexible construction and customization, as well as the playfulness derived from the multicolored components. Blu Dot founders Maurice Blanks and John Christakos met in college and built a friendship around their shared passion for design. Blanks and Christakos, who are both trained architects, collaborated with their friend, sculptor Charlie Lazor, to start Blu Dot in 1997. Working from their Minneapolis studio, the company has set itself apart with designs that marry modern design with style, accessibility, practicality, affordability, and quality. With subtle tips of the hat to design icons that came before them, Blanks and Christakos continue to define what modern design is to popular culture and a contemporary audience. Blu Dot is the winner of the National Design Award in Product Design in 2018.